New to the Royal Teak Miami Outdoor Patio Collection for 2011 is the versatile Miami Sectional. It is a very simple design with only 2 components, the Miami Sectional Base Unit (Corner, Right End with Arm and Left End with Arm) and the Miami Sectional Insert Unit (Armless Chair) giving you unlimited versions and flexibility in regards to size to suit your individual needs. If you are looking for a longer section you can build your own deep seating outdoor patio sectional sofa by adding the additional Armless Chairs needed. Buy this and you can Save an Additional $450 Off on Royal Teak L Shaped Miami Teak Sectional and Table. With coupon code: MIAMISECTIONAL. Royal Teak Miami Deep Seating Set of Two Teak Reclining Chairs, Ottoman and Side Table Set offers the ultimate in relaxation whether sitting on the patio or deck or even poolside. Extremely comfortable deep seating and the chairs recline in three positions. So sit back and spend some quiet time reading a book or enjoy casual conversation with friends and family. Buy this and you can Save an Additional 200$ OFF The Royal Teak Miami Deep Seating Conversation Group. With Free Shipping. The 7PC Royal Teak Collection Gala Double Butterfly Leaf Extension Teak Patio Table Set with the Florida Teak Folding Chairs is a beautiful addition to any patio or deck. This teak dining set that comfortably seats 6-8 people. This beautiful teak expansion dining table expands from 64" to 80" to a full 96" to accommodate your casual outdoor dinner parties. The set includes the 64/80/96 Gala Teak Extension Table and 6 Florida Folding Arm Chairs in your choice of Navy, Moss, Black or Off-White slings. Constructed of Grade A Teak that is kiln dried and fully machine made with mortise and tenon joints for a tight fit. The Royal Teak Collection has the highest content of oil in its teak which protects the furniture from the outdoor elements, no matter what climate you live in and will ensure you a lifetime of enjoyment with your teak furniture. So buy this and Save Over $2200 Off on 7 Piece Teak Expansion Table and Chair Set Now Only $3400.00 with Free Shipping. When you use coupon code GALA at Checkout. Royal Teak SunDaze Teak Sun Bed Sun Lounger with White Sling. For the ultimate in summer relaxation this Teak Sun Bed is a very comfortable lounge chair constructed of solid teak and sling material in the back rest and seat area. Delivered knock-down with easy assembly. The Royal Teak Collection is made from Teak harvested in plantations controlled by "Perum Perhutani" (Government Controlled). This ensures you the best available Teak on the market, (A Grade). The Royal Teak Collection is kiln dried and fully machine made with mortise and tenon joints for a tight fit. Only brass or stainless steel hardware are used and the high content of oil in their Teak, protects the furniture from the outdoor elements, no matter what climate you might live in, and will ensure you a lifetime of enjoyment with your outdoor teak furniture. Buy this and you can Save $300 OFF on The Royal Teak Sun Daze Teak and Sling Lounger for Only $688.99 with Free Shipping. 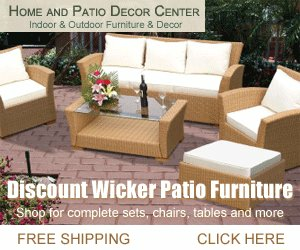 Home and Patio Decor Center! Where you can shop for fine home furnishings and patio products. We offer a selection of furniture products for every room in your home, and your patio, too! And that’s not all. Whether you need bedroom furniture or garden lighting, pet products or items for the nursery, here at Home and Patio Decor, we have brought together the highest quality home decor products sure to please even the most discerning tastes and styles. You can shop from an array of brand names, price ranges and decor styles. Our carefully selected home and garden collections include virtually any home furnishing you might need, offering everything from wood to wicker!